So how was the UW class and what is next? I finished the paper yesterday. I thought I was finished and then I took out the placeholder that forced the document to read the pages side by side and realized that my page number just went bonkers. After fixing all the items that were page number dependent, I then reread the comments made by the instructor on an early draft and found some small items I had not incorporated. I also tweaked some footnotes. Then I reread the assignment and found that I needed to include a pedigree chart and a family group sheet, so I did. Lesson Learned: read the instructions at the beginning and at the end to make sure all the details are wrapped up! I will eventually post the document here but not quite yet. Meanwhile, I have been working on Irish citizenship for my friend/client. That has been interesting. I have sent for two documents (Irish birth record and MT marriage certificate.) She is in charge of the others. Also, have started writing up her findings on her maternal line. Have them about done. Want to wrap that up and get on to Susan’s and Mary’s projects. Next? A friend from class and I are thinking about taking the BU course. I also am considering taking the ProGen Study course but that is longer. I would rather have intense and shorter. Your thoughts and comments about each of these courses would be helpful. What I have done since the last post: finished the paper for the class (I will turn it in 1 week early because I will miss the last class.) and now my study area is a mess. A clean up is in order. 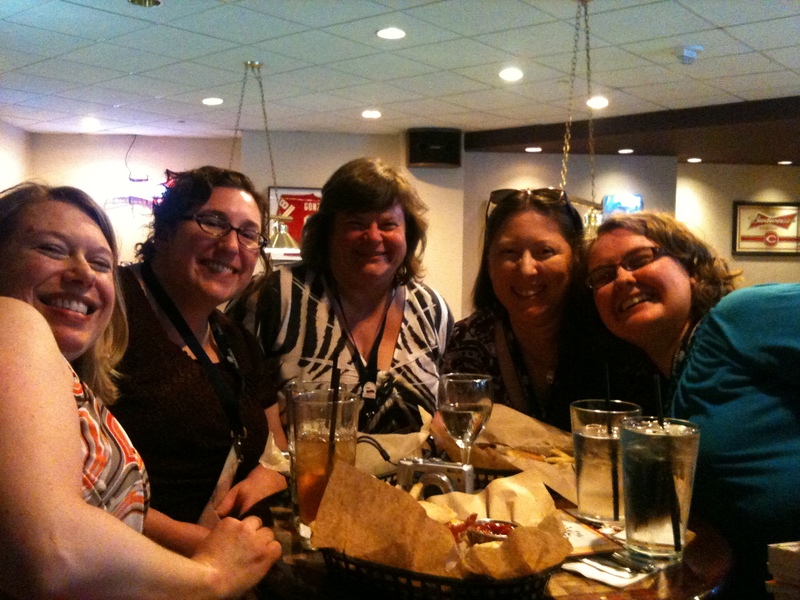 The genealogy bloggers met tonight at a bar in a nearby hotel. Thanks, Amanda for organizing it (via Twitter)! It was great fun. The community is more varied than you might think. I met a person who blogs about the Family Jones, another about Hamilton Genealogy Society and yet another blogs about her books on the engagement of grade school and high school students in family history. We had about 10 there at sometime during the night. Two of the afternoon sessions I attended were the topics of discussion. Some questioned the conservatism of ESM’s session on copyright and plagiarism. Some thought she was overly conservative and that bloggers might as well quit if we were to try to live to the standards she espoused. I didn’t go that far, but she certainly was conservative and perhaps unnecessarily so. Barbara Vines Little, who rode down the elevator with me as we went Our respective ways for the evening, was the instructor in the last session of the day on proof arguments. The bloggers thought her presentation did not cover the topic particularly well and left a couple of key concepts to be assumed by the crowd. Things I have done since the last post: took a walk around the Exhibit areas (I’ll report more on that later. ), went to Walgreens and pick up some diet coke (it’s $3.85 in the convention hall), found out that the Zaha Hadid (architect) Art Gallery is very close, learned about the ProGen study Group (I have to look into this). about 15 showed up; that’s Amanda on the right.